Take your playing to a whole new level! I have received excellent guitar tuition from Mike since I started 6 months ago. I would recommend Mike to anyone who is looking to start learning guitar like I was, as both his patience and guidance has helped me progress more rapidly than I had expected. As a student of Mike Pearson for some time now, I can highly recommend his relaxed yet extremely professional tuition. His teaching of the guitar is both enjoyable and also highly informative. His extensive knowledge of both the guitar and music in general is outstanding. I have never played any sort of musical instrument, till Mike started to teach me the guitar. He is very friendly, professional and patient, and teaches in a relaxed and easy manner to suit each student. I can highly recommend him. Thank you for all your support and astonishing music teaching for Nathan for the past year. Mike is a very able teacher; he has great patience and is able to adapt effortlessly to the needs of his students without losing any of his enthusiasm for the instrument or for the effort and achievement of the student. He has a very practical approach which ensures that the student l earns both what they want and what they need to learn. Mike taught me guitar in 2008 when I lived in Leeds. I can confidently recommend him as a very attentive, skilled and motivated teacher. All the best, Mike. Included, as a standard for all of my students, is a complete posture analysis & awareness guidance. This is one of the first things that I'll be going over with you as part of your foundation of learning. This includes finding your optimal fretting-hand position. Develop and enhance your lead playing by learning some cool sounding licks and solos. I'll make it easier than you think to sound great! Solidify your rock grooves by working on your timing and subtle hand movements. Refining this will set you apart from most beginners. Learn & master popular playing techniques. These techniques are used throughout much of the course and are transferrable to all other styles and genres. Learn famous guitar riffs that have stood the test of time. Easily recognisable to anyone remotely interested in the genre. Learn standard scale & chord shapes that are not only fundamental to playing guitar, but that are also easily transferrable to any other playing style. You have the option to choose your own favourite riffs to integrate into the course. In fact, I encourage you to pursue your favourite music, as this will only enhance your progress and enjoyment of the course. Course content is customised to suit your ability level, progress & musical preferences. Although this course is well structured, it is designed specifically for you. Enjoy creating your own melodies, while demonstrating your knowledge of the scales that you will learn. You will have access to professional grade studio equipment, which has the capabilities to create almost any guitar sound that you can think of...! This gives you an opportunity to learn about & create your preferred distorted guitar sound. This is a structured course that gives you a clear set of outcomes to achieve. You will know exactly what you will be learning over the duration of the course. Handouts are given with each new topic that you learn. You can then easily refer to them when practicing and going over the material at home. Having a guitar tutor is just like having a coach, and with that comes accountability. By knowing that you will be attending your guitar lesson each week, you are more liky to put in the practice that will ensure your success. Also, with the use of tools that I've designed, I will help you to get into a great practice habit. I'm here to help you to get the most out of the time we spend together. I will also support you through the week if you have any questions that you would like answered. You will receive a personalised certificate of achievement that you can place at home. Be proud of how far you have progressed & improved by the end of the course. Upon completion of this course, you will have the opportunity to advance your education further. 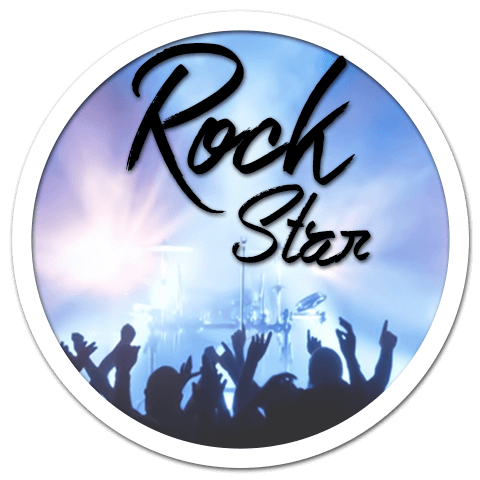 This could be by either taking additional courses or continuing with private guitar lessons down the Rock Star course path that you have chosen. This option ensures a comprehensive understanding of the materials and topics covered. This is perfect for you if you would like to know it all! Ideal if you are interested in the acoustic playing style and would like to explore different topics in a format that you can't find anywhere else. This is a great option if you are keen to get started, yet would like to have the freedom to pay as you go with lessons. It'll give you a small taste of what's to come in the rest of the course. I am a professional guitar teacher based in Leeds, UK. Having taught 400+ regular students over 13+ years, I am confident that I have the relevant experience to help you to achieve your guitar playing goals & dreams. Copyright © MJP Guitar Tuition. All Rights Reserved.